This Thanksgiving, I continue to believe in the Trinity which includes God, Mother Nature, and the Miracle of Science. November 22 is Thanksgiving and November 25 is the National Awareness Day for Embryo Adoption– both days inexorably linked for our family. We remain indebted (and, actually, in debt) to our fertility clinic for bringing the potential for life in the form of embryos into actual human beings, in the form of our children. After we had our son, we began the process again given our ages and belief it could take another three years to grow an embryo. There were 10 embryos leftover from our daughter’s round of In Vitro Fertilization. Our little girl was born first round and thus ensuring our decision to donate our remaining embryos. Instead of wondering daily if these microscopic “life potentials,” tiny miracles requiring all superpowers of God, Mother Nature and Science, were ever adopted by another family, I wrote True North imagining the kind of family who might adopt embryos like ours. If you are reading this, then perhaps you’ve been born into a wonderful family who really, truly, very much wanted children of their own. Maybe your mom or dad has a spinal cord injury like your genetic siblings. Maybe your parents tried for years and years and years and spent thousands of dollars to bring you into this world. Maybe your dad had sperm, but they weren’t strong swimmers. Maybe your mom’s eggs were too old. Maybe one of them had cancer. Maybe it was too risky to try to retrieve sperm or eggs. Maybe you had two moms or two dads, or maybe there was just a medical issue that no one could explain or fix no matter how hard they tried. But you were wanted, and whoever brought you into this world remains forever grateful, especially at Thanksgiving that you arrived in the form of their baby. There were 10 of you leftover from our daughter’s round of In Vitro Fertilization. We never referred to our own frozen embryos as snowflakes as the rest of the world recognizes them; rather we found humor in calling them Krillsicles, believing this was a little potential for life, suspended in ice and time, defying gravity along with the laws governing life. When we were trying for our first child, unsuccessfully for years it felt, my body responded almost too well to the stimulation process for egg retrieval. Later, we had 12 viable embryos and used up all of them over many different rounds, and our son was born from the very last two implanted. Then I wished for twins so that we would never again have to spend ALL of this crazy money just to become parents. The day he was conceived in a petri dish was actually over a year from when we actually became pregnant. The miracle of science! Without the success of the In Vitro Fertilization, Geoff and I would not have the wonderful life that we get to call our own, and we hope the remaining embryos do the same for others. That is why this Thanksgiving as we do every year, we remain grateful for a good many reasons. And every year our list morphs a little bit whether we are 8 or 80. 1. Blessed by 7 and 8 years of life with my children, 12 with my husband, and almost 44 with my own parents. 2. Blessed by a clean mammogram again this fall. 3. Blessed by an endless friendship and a community of individuals who stand and deliver when needed. 4. Blessed by a truly loving husband with strong arms to shoulder the challenges of his disability and raise others up to reach their potential too. 5. Blessed by a 22-year teaching career that I still love most every day because I’m lucky to have amazing students, caring colleagues, and a thoughtful administration to work for. 7. Blessed by our freedoms as Americans along with our right to vote. 8. Blessed by a mostly accessible home, working woodstove, and three cords to keep us warm this already frigid, snowy winter. 9. Blessed by mountains to ski upon, rivers to swim in, a friendly neighborhood to skateboard, dog walk and meander along, alone or with buddies. 10. Blessed by the gift of optimism our parents bequeathed to us at birth. 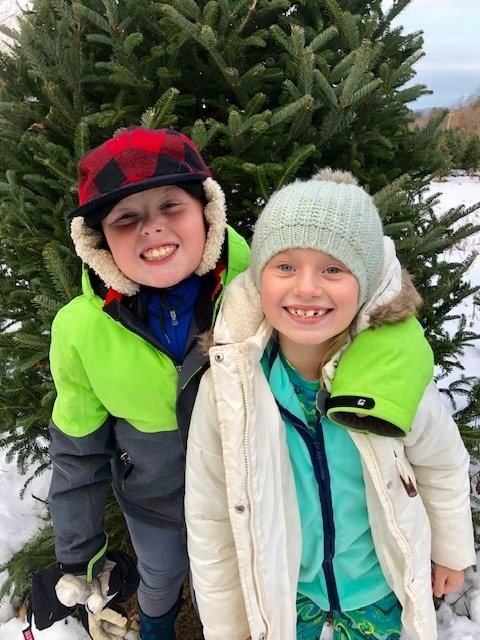 Heather Krill is a writer- wife- teacher-mom who lives in the White Mountains of NH with her husband, Geoff, a paraplegic and professional skier, and their two children, Carver and Greta who are 8 and 7. Please check out her novel True North, website http://www.heatherkrill.com, author FB page Heather Krill, and @heatherkrill1 on Twitter.